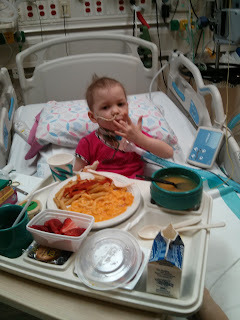 Since our last blog post Shoshana was home for seven days before once again having nausea, vomiting, diarrhea, and overall dehydration. The first day was, again, gut rest then instead of going straight to formula they proposed starting with pedialyte instead. A quick google search confirmed my suspicions that the formulation of pedialyte had ingredients that made me uncomfortable. Namely, the dyes and "natural and artificial flavors," ingredients and labeling ambiguity that are both banned in the UK. It took a bit of back and forth discussion (read: standing my ground) to get the staff to agree to a formulation that included some sort of food such as juice, water, salt, and minerals. Why does that have to be so difficult? All over the world rehydration does a good job in the majority of cases without pedialyte. Where I was in Mexico the prescription for gut issues always included limonada since limes were abundantly available. I managed to convince the team to allow a juice formulation once I said that if that doesn't work I'm more than willing to try dye-free pedialyte. But before we knee-jerk to the industrial formulation which only includes the base chemicals, vitamins, and minerals and "natural and artificial flavors" can we try some food? I understand there are cases in which the body needs a temporary rest from processing foods but still needs base nutrition but I was not convinced this was the time for Shoshana. The gut rest and slow rehydration had an unexpected side effect: Shoshana ate! Like, constantly! Not big amounts but she was almost always putting something in her mouth. This did not happen last time. 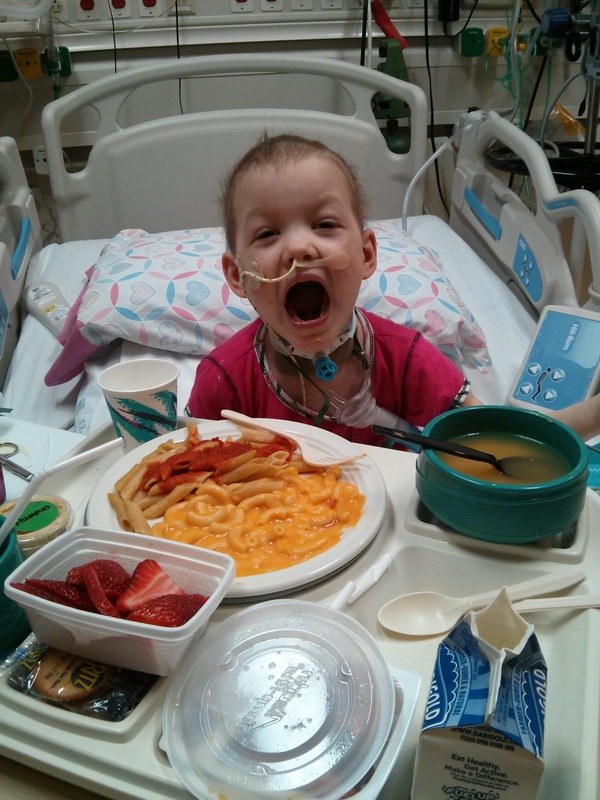 She even ate a few things that she hadn't touched since before her diagnosis such as oranges, PB&J, and granola. As we continued to brainstorm what could be causing Shoshana's latest gut issues Dr. Labriola, our pediatric oncology naturopath, suggested a few things and the hospital nutritionist concurred: we changed the hemp milk to rice milk and we purposed to feed her with rest breaks and a few spoonfuls of yogurt at the beginning of each tube feeding to support the digestive flora. This seemed to help since she continued to want to eat even as we worked our way up to the goal calories per day. 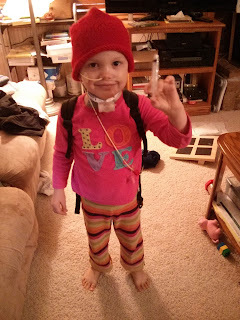 Within a few days she improved greatly and we made it home on Friday afternoon. Other than an extra dose of pain meds and going to bed early she seemed normal. Tim and I got to sleep in the same bed at the same time for the first time in a week... for one hour. The night nurse knocked and informed us that Shoshana was very uncomfortable all evening and has been mounting a fever over the last 30 minutes and the latest reading was 38.5C/101.3F. 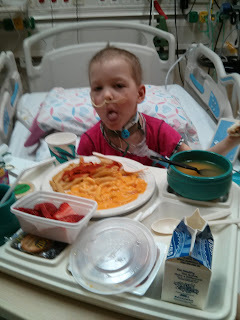 In all the time Shoshana has been neutropenic this is only the first or maybe second time since she has gone over 101F. She runs low 97's like I do and a change of two degrees is enough to make anyone feel crummy. I asked Tim to take her to the ER because I was so wiped out and sleep deprived and the weekend is usually his shift anyway. By the way, that sets a new record! Discharged at 2pm, re-admitted 12 hours later. That is not the shortest time between trips to the hospital but it is the shortest time between admits. At least she got to have a bath with little sister which they both thoroughly enjoyed. Now she tests positive for rotavirus which is known for viral respiratory sorts of infections. 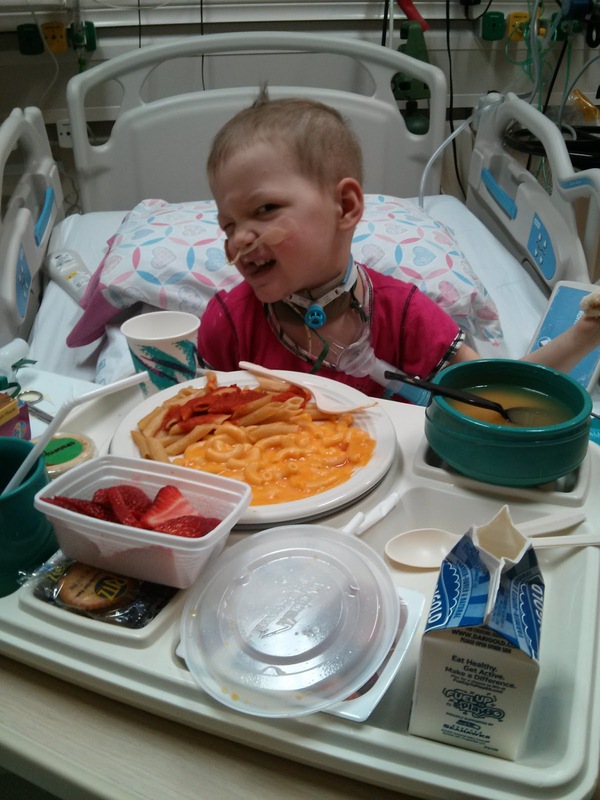 She is on two broad-spectrum antibiotics which put her at high risk for another round of C-diff. Once the microbiology report comes back tomorrow they will be able to change those to more specific drugs. 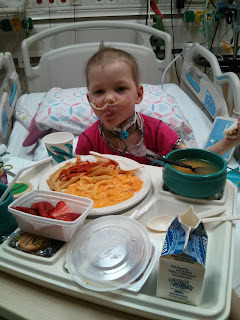 She had a lot of pain overnight and more secretions which make the doctors think of a general tracheitis but at this point it doesn't make much difference whether it is a mid-airway infection or lower airway infection. Over the day she has improved, complaining of less pain, less secretions, and generally feeling "better" though sometimes she would say "bad". 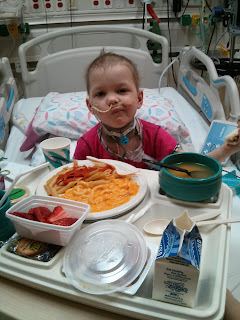 It is possible she could be discharged late tomorrow afternoon but it depends on the microbiology report. It usually takes 48 hours but sometimes more, sometimes less. It depends on her general symptoms too. 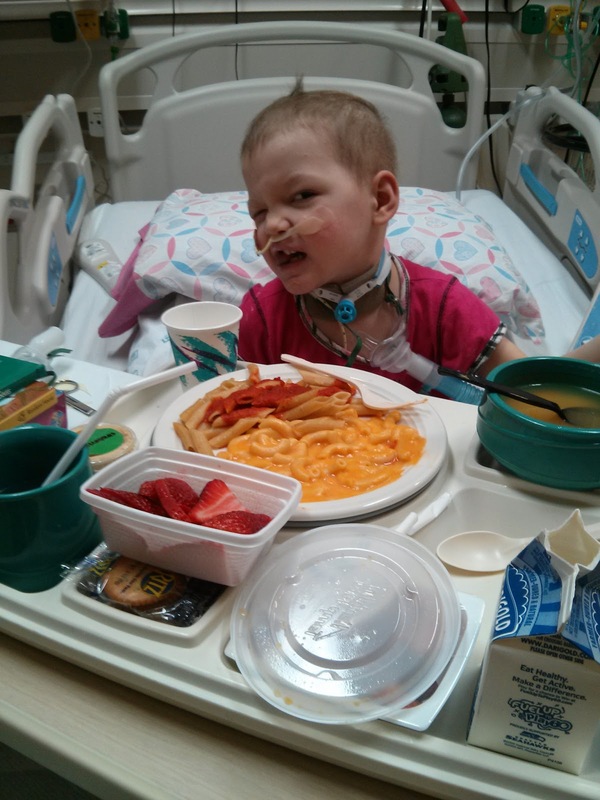 We have an appointment with the clinic on Tuesday to evaluate her readiness for the next stage of chemo called Delayed Intensification with a planned start on Friday. That means adding a nasty drug called doxyrubicin, restarting steroids (yay...), methotrexate, PEG-asperaginase, and vincristine WEEKLY for FOUR WEEKS. Am I anxious about this? Guess. Please be praying for her handling of those drugs. She has gotten at least one dose of each of those in the past but in some ways this stage is even harder to handle than the first stage of treatment. A lot of hydration fluids are required on multiple days to protect the kidneys, lots of labs to monitor, white blood cells hovering around zero, and possible red blood cell or platelet transfusions. Not to mention the pain and nerve damage from the vincristine. This will be the second time she is scheduled for so much vincristine in so little time and we know how that ended. Obviously, she has a trach tube in place so, theoretically, her airway is "stable" but there has literally never been a case like Shoshana related to vincristine. In my research I've learned that there are only six other known cases of survived vincristine toxicity, one of which was a girl. Only one of them (a boy) needed a trach for a short time after extubation. None of them had the pain and nerve side effects Shoshana is experiencing. 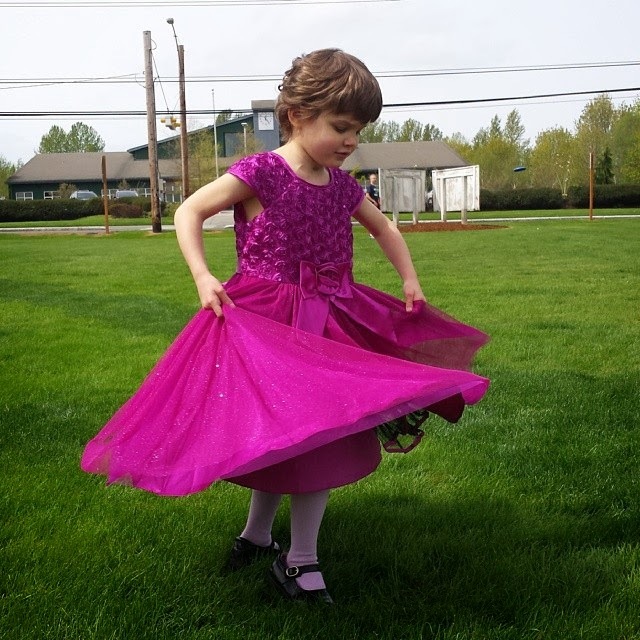 One of the reassuring things about leukemia treatment is that because it is so common and has been around for so long we have a lot of data to help us decide how to treat her. Unfortunately, all that data only goes so far. Please pray for us. For sleep. For peace. For pain relief. For protection from drug side effects.